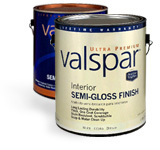 Lowe’s has a new rebate for Valspar Duramax paint. You can get back $5 on a gallon or $20 on a 5 gallon bucket of your paint. This offer is good on purchases made through April 18th at your local Lowe’s store. Head over here to get information to submit the rebate.